My friend Fireweed gave us a large bundle of her home-grown rhubarb the other day, and I was trying to think of something out of the ordinary to do with some of it. At the same time, I was inspired to make a creamy lemon curd ice cream. My friend and fellow vegan cookbook author Betsy DiJulio (The Blooming Platter Cookbook) had developed a delicious recipe for a blueberry ice cream containing my own Quick Vegetable-Based Lemon Curd. I made Betsy's recipe and it was fantastic! The lemon curd really added to the creamy texture, which was what got me thinking of a Lemon Curd ice Cream. When the rhubarb arrived and I was searching for ideas, it occurred to me that a rhubarb jam would be wonderful swirled into the lemon curd ice cream that I was dreaming up. 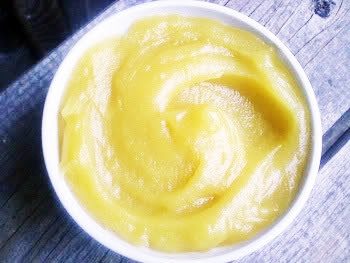 My lemon curd recipe is somewhat unusual, as it is not only vegan, but vegetable-based. You can read about it, and get the recipe, at this blog post. I make it in the microwave, and I did the jam in the microwave, too, so these components of the recipe are easy and quick to make in small quantities. the lemon curd is luscious, sweet and tangy, and Betsy has used it in another of her amazing recipes, Vegan Lemon Verbena Shortbread Sandwich Cookies with Vegan Lemon Curd Filling. I really have to thank her for the inspiration-- I may never have thought have using it in ice cream if it hadn't been for her! In any case, the ice cream turned out wonderfully well. We had dinner guests last night and they (normally moderate eaters) eagerly consumed second helpings (as did DH and I). The ice cream would be very good all on its own, too, or swirled with a raspberry coulis instead of the rhubarb. I hope you'll give it a try! 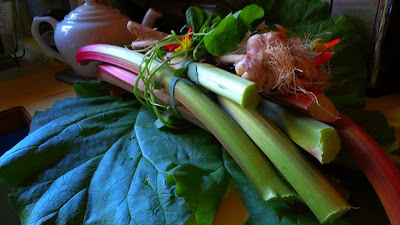 Many thanks to Fireweed for the beautiful rhubarb, and to Betsy DiJulio for the culinary inspiration! Process all of the ingredients EXCEPT the jam in a high-powered blender or Vita-Mix. Chill until the mixture is very cold. Freeze according to the directions for your ice cream maker. 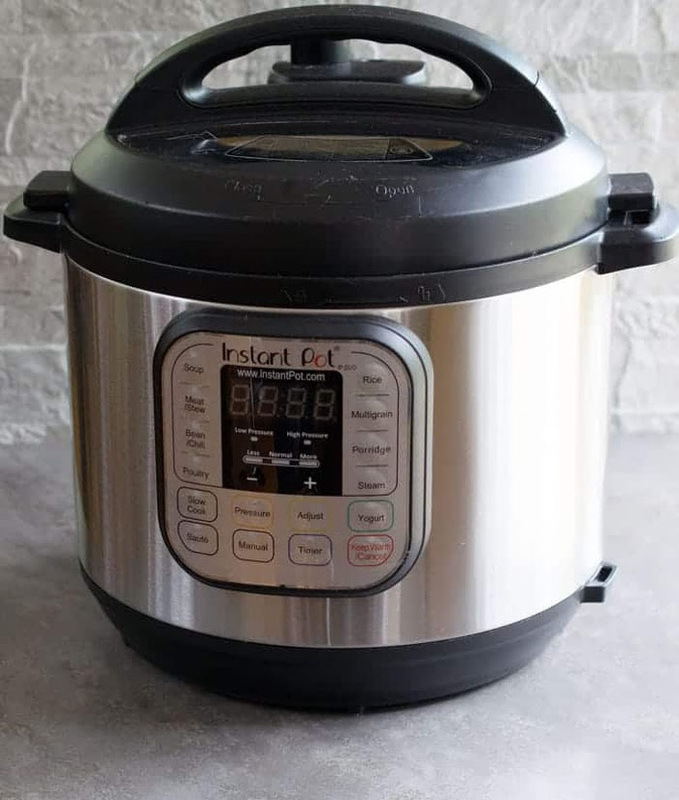 I use a Cuisinart ICE-30BC Pure Indulgence 2-Quart Automatic Frozen Yogurt, Sorbet, and Ice Cream Maker and it took about 20 minutes freezing time. Spread the mixture into a 2 quart rectangular glass or ceramic baking pan or a rectangular 2 qt. freezer container. For the swirl, drop blobs of the jam in two lines down the length of the ice cream. Take a table knife and swirl it into the ice cream. Cover and freeze for several hours before serving. Nutrition (per 1/2 cup serving): 230.1 calories; 15% calories from fat; 4.2g total fat; 0.0mg cholesterol; 60.8mg sodium; 193.1mg potassium; 43.7g carbohydrates; 1.6g fiber; 38.3g sugar; 42.1g net carbs; 2.0g protein; 4.6 points. Only the ice cream: Nutrition (per 1/2 cup serving): 194.8 calories; 18% calories from fat; 4.2g total fat; 0.0mg cholesterol; 60.3mg sodium; 154.8mg potassium; 34.7g carbohydrates; 1.4g fiber; 29.8g sugar; 33.3g net carbs; 1.8g protein; 4.0 points. This jam is also delicious on toast or scones. In a 2 qt. microwave-safe batter bowl (glass or ceramic), mix the sliced rhubarb, lemon juice, grated ginger and sugar. Cook, uncovered, at 100% power for 8 minutes. Stir well and cook on 100% power 5 more minutes. Stir well and cook at 50% power for 7 minutes. If your rhubarb looks quite green, stir in the beet optional juice. If you will be using this in an ice cream, stir in the optional vodka or white vermouth. Scoop the jam into a scalded 1 pint canning jar, seal and cool thoroughly on the counter. Refrigerate. Nutrition Facts: Nutrition (per tablespoon): 52.9 calories; 0% calories from fat; 0.0g total fat; 0.0mg cholesterol; 0.8mg sodium; 57.5mg potassium; 13.5g carbohydrates; 0.4g fiber; 12.7g sugar; 13.1g net carbs; 0.2g protein; 1.0 points. We had a very yellow-hued dinner tonight. There's a very short corn season here on Denman Island, so we eat it fresh-picked as often as we can while it lasts. So, delicious sweet, ripe corn-on-the-cob was our "main course". Our second course consisted of a couple of slices of fresh homemade crusty bread with olive tapenade, and the following light summer soup. 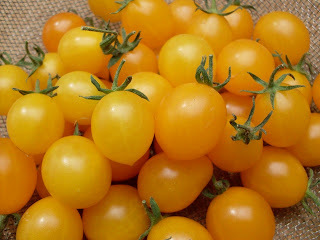 We have one tomato plant in the garden which produces LOTS of quite small yellow cherry tomatoes. They have a delicious tartness which I thought would be good in a soup, so this is what I came up with. It's a bit reminiscent of gazpacho, but needed no added acidity, due to the natural tartness of the tomatoes. I added the yellow pepper to add more body. It's a mild-flavored, delicate soup, but very satisfying (in fact, we felt extremely well-filled after our vegetable-based meal-- or "full-top" as the say in Quebec, according to my husband). I hope you will try it! I sweat the onions, pepper pieces and garlic in the olive oil in the microwave oven in a covered microwave-proof casserole for about 7 minutes on 100% power, or until the vegetables are soft, but, if you prefer, do it in a heavy non-stick skillet over medium-high heat, stirring frequently. Mix the softened vegetables in a blender with the broth, tomatoes and thyme. Blend until the mixture is smooth. Taste for salt and pepper. Chill the soup thoroughly before serving with garnish of your choice. 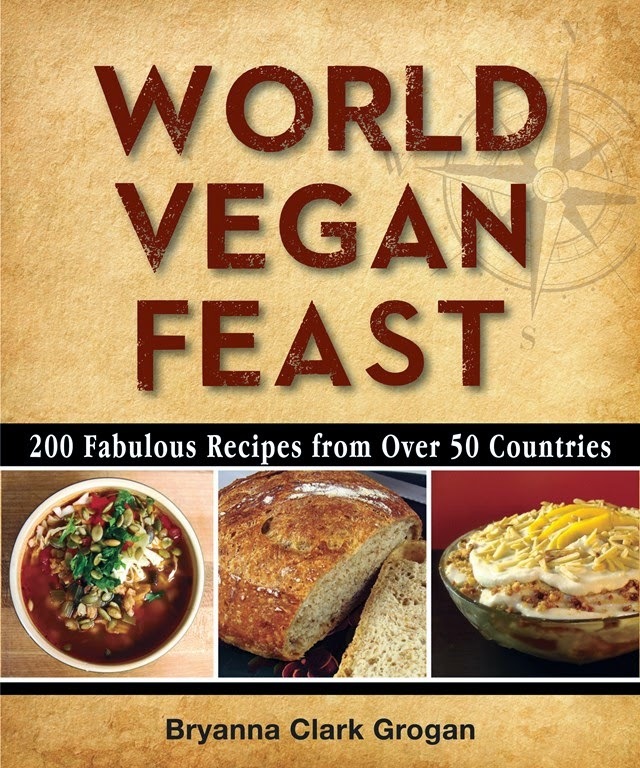 I'm always looking for ways to improve on my vegan quiche recipes. Today I had an idea for a quiche with the flavors of a Spanish potato omelet (called a tortilla) with chorizo. And I wanted to make sure that it could be easily cut and consumed while still warm from the oven, rather than waiting for it to cool first. This is a slice cut while the quiche was still hot. The recipe below is the result of my "tinkering" and it made a delicious dinner with a big green salad (with some left over for lunches). The filling is smooth and creamy, with just enough spicy contrast from the sausage. Mix the dry ingredients in a bowl. In a smaller bowl, whisk the milk with the lemon juice, and then with the oil. Quickly stir the liquid mixture into the dry ingredients and mix briefly, forming the pastry into a ball. If it's too dry, add cold water just a few drops at a time until it holds together. Don't over mix or the pastry will be tough. If made ahead of time, place dough in a plastic bag and refrigerate it until you're ready to roll it out (several hours or even several days). Roll out the dough on floured baking parchment to fit a 9" or 10" tart or pie pan (roll out 12” in diameter), which has been greased with Cake Release. (If using a pie pan, just bring the pastry up to the inside top of the pan and flute it, to make a shallow shell-- not over the edge, like an American pie.) Trim the top edge neatly and prick the bottom and sides all over with a fork. Bake 5 minutes. Remove from oven (leave oven on). Cool the pastry on a rack. Grate the cooled, cooked potato and set aside. Heat the oil in a large nonstick skillet over high heat. Sauté the green onions and bell pepper until wilted. Add the crumbled sausage and stir-fry for a couple of minutes. Scrape onto a small cookie sheet and place in freezer to cool quickly. Blend the Creamy Mixture ingredients until smooth in a blender. Mix the cooled sausage mixture with the grated potato. Spread the mixture evenly over the pre-baked,cooled pie crust, sprinkle with the nondairy cheese, and pour the Creamy Mixture over it evenly. Sprinkle the top with a bit of smoked paprika. Place the quiche in the oven and immediately reduce the heat to 400° F. Bake 35 minutes. Cool on a rack for about 30 minutes before serving. This will keep well, refrigerated, for a few days. Nutrition (per serving): 340.2 calories; 41% calories from fat; 15.6g total fat; 0.0mg cholesterol; 624.5mg sodium; 448.6mg potassium; 36.3g carbohydrates; 5.2g fiber; 3.7g sugar; 31.1g net carbs; 13.8g protein; 7.3 points. Omit the tofu and use 7 Tbs raw cashew pieces and 6 Tbs more non-dairy milk instead. 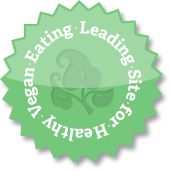 Use soy-free vegan cheese. Another idea (which I haven’t tried yet) would be to omit the tofu and use 3/4 cup (packed) canned or cooked white beans, rinsed and well-drained. Use your favorite gluten-free crust recipe. I haven't blogged for 2 weeks! Sorry about that-- I blame it on a combination of company, birthdays, family members moving house, and summer lethargy in the calm after the extreme busy-ness! 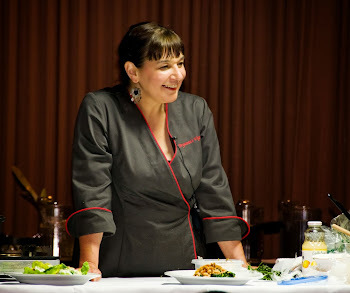 Actually, the last few days I've been working on a review of a friend's new cookbook-- one we've all been eagerly anticipating-- but it's going slowly because I want to do it justice. So, I'm blogging about more mundane items today. As many of you will know, I live on a small island with a friendly general store, which is quite small and covers mainly the basics. We have to go off-island for most things. Today I was planning to make a corn chowder that needed a cheddar-type cheese of the vegan variety, something the General Store does not carry. So, I turned to my recipe for quick, low fat "Melty Cheeze" in my third low fat cookbook, "20 Minutes to Dinner" (from 1997, now out of print but still available). It can be used as a spread, melted cheese, and for making cheese sauce. More about it (+ the recipe-- with a few revisions-- of course) below. Aside: Why am I making chowder in the height of summer? Well, for one thing, it's only pleasantly hot here, not searingly. For another, it's great to have homemade soup in the fridge for a quick snack or meal (we're having it for dinner tonight with homegrown tomato sandwiches). But, in addition, our dog Phoebe much prefers her vegan kibbles mixed with a little brown basmati rice and whatever soup is on offer! The third recipe that looked useful for my purposes was "Pourable Non-Dairy Cream". I had some Tofu Chocolate Mousse that I thought would be improved by some creamy topping, and I also needed just a 1/2 cup of "cream" for the above-mentioned soup. All of these recipes are simple, easy, inexpensive, low fat, and tasty and I figured that I can't be the only one who could use such recipes in an emergency (and maybe on a more regular basis), so I'm sharing them here. "Pourable Non-Dairy Cream" on the Tofu Chocolate Mousse (from my book "Soyfoods Cooking for a Positive Menopause"), with candied organic ginger-- I'll post the mousse recipe one of these days. Adapted from a recipe in my book "20 Minutes to Dinner". If you have a ripe banana on your counter or in your freezer, you can quickly make a tasty "milk" for your breakfast porridge. Any leftover can be used in a smoothie. Process all ingredients in a blender until very smooth. Use immediately. Leftovers should be refrigerated in a covered jar and shaken well before using. If you use soft silken tofu, this is like a cereal cream. If you use firm or extra-firm silken tofu, it will be like a thick pouring cream for puddings or desserts. For a cream that has no discernible soy flavor, use commercial rice or almond milk. To make Soy-Free, use cooked short grain white rice instead of tofu. Place all the ingredients in the blender or food processor and process until very smooth. Place the cream in a covered container and refrigerate for several hours before using. This easy vegan “cheddar” is tastier than most commercial vegan cheddar wanna-be’s, and much cheaper, too. It makes great grilled cheeze sandwiches and quesadillas, and can also be used to make a cheese-y sauce. Place the water, yeast, oat flour (or alternate), miso, tahini, lemon juice, salt, garlic granules, paprika and mustard powder into a blender and process until very smooth (the oat flour will take a little longer the the cornstarch/flour mix). Pour the blended mixture into a small saucepan, or into medium microwave-proof bowl or pitcher. Stir over medium heat until it starts to thicken, then let bubble 30 seconds and whisk vigorously, OR microwave on 100% power for 2 minutes, whisk, then microwave at 50% power for 2 minutes, and whisk again. Whisk in the water until smooth. Drizzle immediately over your food and broil or bake until a skin forms on top; OR, if not using immediately, refrigerate in a small rigid covered container for up to a week. It will get quite firm upon chilling, but will still be spreadable and melt-able. You can spread the firmed cheeze on bread or quesadillas for grilling, heat it to spread more thinly on casseroles, etc. To make a sauce, blend the cheeze with nondairy milk, dry white wine or beer (or a mixture of milk and one of the alcoholic beverages), at the rate of 2 parts cheeze and 1 to 2 parts liquid, depending on the thickness you want. Heat gently. You can see that I left this under the broiler for a little too long-- but it was still good! For lunch, I made a version of a zucchini dish that my mother used to make-- halved small zucchini, par-cooked (I used a microwave), topped with tomato sauce (you could use a spicy one, if you like), and then, in this case, Melty Chedda' Cheeze Sauce (you could use warmed undiluted Cheeze instead, if you like). Place under the broiler, with the rack on the second level, and broil until it has a dotted brown skin on it. I hope these recipes will come in handy for you some time. Enjoy!